I mentioned last year how much I love to turn to PJs Organics when I don't feel like cooking and I am still just as excited about PJ's Organics Burritos this year and in the year to come...especially now that they have come out with some new varieties! PJ’s Organics is the original and unique brand of healthy, organic frozen burritos. Featuring authentic Mexican seasoning and flavors, this tasty food creation comprises healthy ingredients while flawlessly maintaining its rich flavor. In 2007, PJ launched the first and only brand of organic meat burritos – using only organic ingredients sourced locally wherever possible. And hand-crafted. They're one of the few businesses that make their own tortillas – and we’ve been hand-rolling everything before it was fashionable. That is why I am trust them to make meals for my family when I just can't find the energy! And GMO's, pesticides, preservatives...won't find them in any of their burritos! This year, they released FOUR new varieties and they all have quite the kick to them! They were a little too spicy for my children but adults seem to enjoy them! But best of all, they have ingredients I trust and love...even to fill my children's bellies! 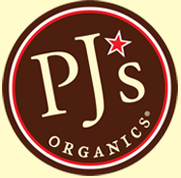 Buy It: You can purchase PJ's Organics products nationally at supermarkets and natural food stores. Look for them in the frozen food section of the natural products area.